The bus firm, Lincolnshire Roadcar, has been summonsed to appear in court in connection with a defective brake on a bus involved in a crash. The vehicle was involved in a crash in Ingoldmells in 2004 which killed a Leics mother, her two young sons and a married couple from Mansfield, Notts. The firm will appear before magistrates in Skegness in February. The driver is due in the same court on Tuesday, charged with five counts of causing death by dangerous driving. The 51-year-old man from Louth has been released on bail after being charged with the offences on Monday. 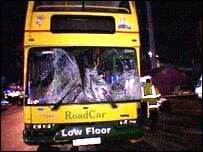 His bus collided with a group of pedestrians on Sea Lane. The five who died were Joanna Warren, 37, from Braunstone, Leicester, and her two young sons, Jacob, five, and four-month-old Leyton, plus married couple Richard and Paula Rhodes, from Mansfield.